We all go about our lives creating a world around us. To us, we are the stars of a film; our surroundings are the set; and the people touching our lives supporting players and/or extras. Philip Seymour Hoffman’s Caden Cotard watches as the plays he directs onstage succeed and garner praise while the life he lives with wife and daughter falls apart around him. As a God, crafting the activities and molding the characterizations of a cast, his own humanity is lost and hidden behind an insecure and scared shell of a man. Cotard is truly a selfish person who has thought only of himself and, in turn, looked upon those around him by how they interact in his own life. We do audition the people we hold dear; they must pass a test before we allow them in our lives. Some go on to play bigger roles while others get fired for not doing their job. We raise our children and build them into what we feel a child should be, shaping them to grow up and succeed. It is all carefully orchestrated in the movie of our life, but until you realize that the extras in your story are the leads in their own, you will never be truly happy. Each one will become more famous and sought after, bringing their show to Broadway and Hollywood, hitching a ride on a new director’s coattails, while you stay, stuck and alone, going through the motions in your abandoned back-lot, eternally in Synecdoche, New York. Is there anyone doing things more ambitiously or creatively then screenwriter Charlie Kaufman? The man is pure genius. Constantly delving into the world of fractured realities, his stories deal with multiple layers and intricate parallel universes. With Human Nature he showed us the clash between people raised in the wild with the doctor who finds and attempts to civilize them, all while having cut-scene interviews with the doctor, stuck in purgatory, a gunshot wound in the head. Being John Malkovich brought us a world where every human being is a puppet to be played with and manipulated from the inside; each of us a hollow shell to be filled by an actor, taking our story in new directions. Adaptation blurred the reality of life’s boring monotony with the action-packed excitement of a B-movie storyline and Eternal Sunshine of the Spotless Mind showed how true love is deeper than the memory we have of it. The good will always outweigh the bad and when it is all over, you will only regret why you didn’t try harder to stop it, not knowing that the cycle will inevitably begin again. With Synecdoche, Kaufman makes his debut behind the camera—both Gondry and Jonze off working on their own things—and he does so with the most elaborately challenging of all his work. I’m sure it is a very personal journey about the evolution of a storyteller always creating new and exciting roles, but never taking the time to rewrite himself, to flesh out his own life into one that isn’t full of depression as everyone goes on finding love and success while he stays stagnant in his own self-pity. I didn’t quite know what to expect when delving into this film. At first, it all seemed pretty much rooted in a reality, a slightly heightened one, but still accessible. Cotard was living a life of convenience with his regretful artist wife Adele, (Catherine Keener), and their annoyingly hyper daughter Olive. We begin to catch glimpses of the deterioration of his surroundings as words start to confuse—Ophthalmologist sounds like Neurologist which sounds like Urologist; when speaking of suicide, “How would you do it” sounds like “How did you do it”, etc—and eventually all footing is lost when Samantha Morton’s Hazel buys a house on fire. It appears to be a gag as she speaks of being afraid she might die in the flames, yet as the film continues on, the home is constantly burning, possibly showing her role as devil to Cotard, the ever-alluring vixen he so wants, but can never build the courage to be with. The acting is brilliant across the board, from the large roles to the small. Jennifer Jason Leigh’s mysterious Maria becomes a fully fleshed creature, a destructive force in Cotard’s life while only being onscreen for maybe five total minutes. She takes away his wife and then his daughter, becoming a surrogate for himself in Berlin, the place he was not allowed to follow them to. She, in effect, becomes the first cast member in the life of Caden Cotard; the stand-in for him as he must stay back to work on his MacArthur grant producing masterpiece. The story becomes more and more surreal at this point, Seymour Hoffman’s portrayal becoming more eccentric and crazed with nervous ticks and medical problems cropping up one after another. Time begins to fold in on itself as the years pass by, but seem as only days or weeks to him. A wife and child gone for a year yet he only misses them for a week, thinking they will return once the show overseas has completed. The real world and that of his play, reinterpreting it, meld together into one. The warehouse containing his work now becomes the world he knows with warehouses soon being built inside of themselves, copies of the places in his life built like stage sets to be walled up and forgotten, cast members quitting his life being let-go on stage to save on budgetary costs. 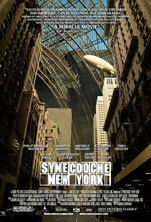 Synecdoche, New York becomes a rabbit hole ever deepening, MC Escher’s Relativity, Caden moving up and down and around, never escaping his maddening world of solitude and selfishness. More and more layers are created as we get Emily Watson cast as Hazel, in the play being written, while the real-life Hazel (Morton) goes on continuing her journey with Hoffman’s Caden. Even Cotard himself begins to play the character of Ellen, a housekeeper for the real-life Adele, who then becomes a character cast with Dianne Wiest in the story. Probably my second favorite move by Kaufman, having a character created for a fictional person, to then eventually be played by Caden again, revisiting the role for which he originated, a person who does not exist on any plain whatsoever … genius. I say second favorite, though, because I absolutely loved the character of Tom Noonan’s Sammy Barnathan. He is ever-present throughout the entire film, seen in the background, watching intently. From the first scene, standing across the street as Hoffman gets his mail, to the shadowed blur in front of the camera as he creeps out from behind a tree when Hoffman meets his muse in actress Claire, (Michelle Williams), at a park bench. He is always there, watching and waiting, until the time comes that Caden needs an actor to play himself. How can he give notes on his own character if he cannot see what he is doing? The only way to improve is to put him into the elaborate play himself, to watch his insecurities and greed firsthand, to acknowledge the error of his ways. However, he is so vapid and egomaniacal that he becomes jealous of the characters themselves. When the real Hazel starts flirting with the fake Sammy, while the real Sammy watches playing the fake Caden, the real Caden can’t help but want it to stop. He therefore breaks his own fourth wall to punish the real Sammy, leading up to an utterly brilliant moment of Noonan confronting Hoffman with the sad reality of all that has been happening in the decades-long project. Only when Wiest’s Millicent Weems takes the job of playing the real Caden—that’s right, the REAL Caden—does he finally get a break to put his whole self into the part of Ellen. He decides to hide inside his own play, all those he loved dead and gone, while Wiest tells him the story of her own life as an actress, eerily similar to his. It all spirals out of control, as Cotard himself can’t remember what happened in his past to bring him to where he has ended up. When he sees his daughter again, dying in a hospital bed, no longer understanding English, her German upbringing replacing her entire childhood, do you begin to wonder who left who? Is what we saw at the start, Keener’s Adele leaving, the truth, or did Cotard leave them to have a homosexual affair? By the time the ending comes, you really won’t know if anything you’ve seen actually happened. However, the final cue, the final note, if you will, given to Hoffman’s “real” Caden Cotard as Ellen Bascomb, couldn’t be more profound in its simplicity. He has needed to be told what to do at every step of his existence, so it is only appropriate that he is told when he can finally take that much-deserved rest. Philip Seymour Hoffman as Caden Cotard, Samantha Morton as Hazel. Photo by Abbot Gensler © 2008, Courtesy of Sony Pictures Classics. All Rights Reserved. 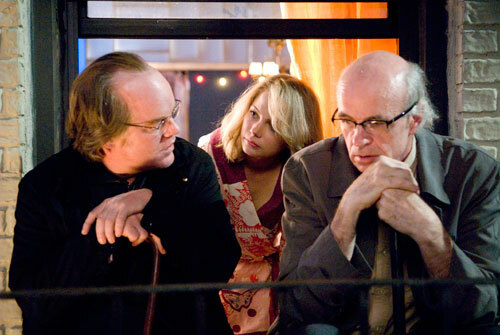 Philip Seymour Hoffman as Caden Cotard, Michelle Williams as Claire Keen, Tom Noonan as Sammy Barnathan. Photo taken by Abbot Gensler, Courtesy of Sony Pictures Classics, All Rights Reserved.